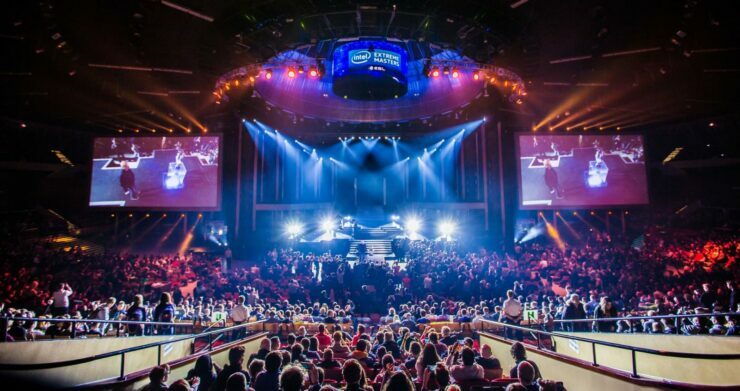 The eSports market is certainly growing, that much is certain. Just how rapid that growth is can be quite hard to determine. As we’ve covered in the past, a number of research companies have predicted growth in the sector. Both Deloitte and Newzoo, early in 2016, predicted roughly $500m and $460m respectively over 2016 with growth in the sector to $1bn by 2019. While the eSports audience is growing, rising from 235 million viewers in 2015 to 323 million in 2016, it is expected to see a marked slowdown. Predictions give an audience of 385 million this year, growing to 589 million by 2020. Of course there is a division in this audience, with roughly half being enthusiasts while others are simply occasional viewers. Converting current occasional viewers, as well as future audiences, into enthusiasts will be a key challenge. As audiences grow, advertising and sponsorships are predicted to make up 60% of revenue as companies look to capitalise on the increased reach of the sector. Although these will make the bulk, other areas are expected to grow by a large amount. 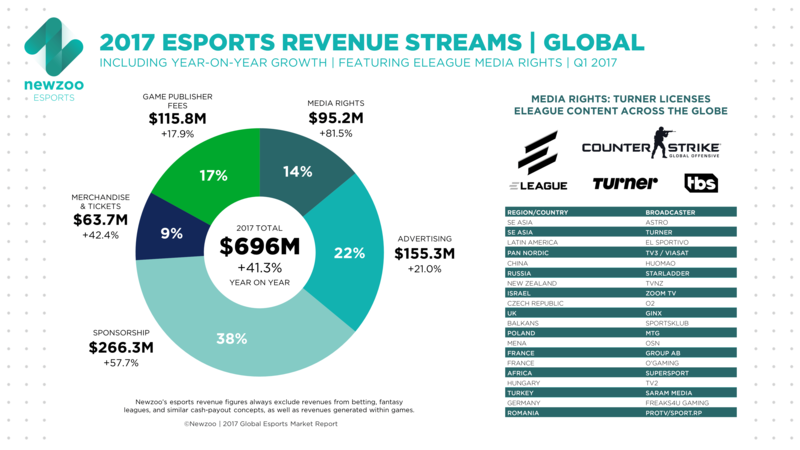 Media rights will are predicted to make the largest gains, 82%, as more networks across the world pick up eSports. Ticket Sales are also expected to increase through an increase in promotions on both a regional and global scale. Just how much comes from different areas is still one of the more surprising aspects. 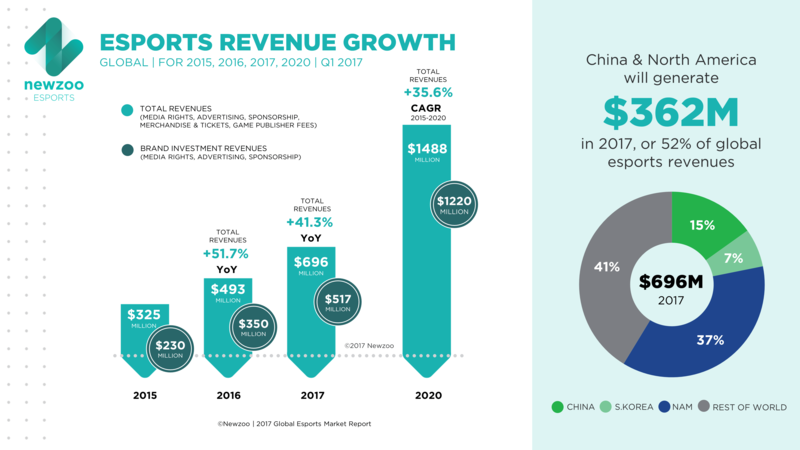 Asia-Pacific is expected to account for 51% of total revenue, Europe and Rest of World bringing 18% each with North America bringing up the rear with 13%. However, due to the population differences and the enthusiasm of the American audience, they bring just over $10 per fan across the year, much higher than any other region. As events increase, the revenue per person is expected to grow exponentially. Particularly as audiences aren’t expected to grow at the same rate as revenue. The location of the more avid fans also improves the already strong position of companies like Activision Blizzard (NASDAQ:ATVI), the company that own Major League Gaming (MLG) as well as a large number of games that directly cater for eSports. In addition to this, companies like Electronic Arts (NASDAQ:EA) have a professional FIFA league and Take-Two (NASDAQ:TTWO) have recently announced a NBA league. Of course other major beneficiaries of the growth comes for the outlets. Streaming services have seen rapid growth and monetising this growth will always be a major aspect. Both Twitch.tv, owned by Amazon (NASDAQ:AMZN) and YouTube’s select gaming related area, owned by Google(NASDAQ:GOOGL), attract the lion’s share of viewers. However, this doesn’t preclude companies creating their own outlets. One prime example of this comes a deal from December last year between BAMTech, a spin-off of the streaming division of Major League Baseball’s internet and media partnership, and Riot Games, developers of League of Legends. Riot Games, a subsidiary of Tencent (HKG:0700), signed deal which guarantees a minimum payment of $300m through to 2023. This indicates a heavy interest in eSports as BAMTech also handle the digital services of the NHL, PGA as well as services like HBO Now and the WWE Network. BAMTech have created a specific League of Legends streaming hub, while also controlling deals made with third-party sites like YouTube and Twitch. Advertisments and sponsorships are also under the control of BAMTech as a part of this partnership. On top of the guaranteed $300m, Riot are also guaranteed an undisclosed share of any profit made. As one of the largest eSports game in the world, League of Legends could very well be the example of the future. Examples of sponsorship and advertising deals are already present. The current Intel Extreme Masters League of Legends tournament, held in Poland, is being sponsored by Gillette. In addition, eSports athlete xPeke is the face of a new ad campaign. Even beyond one game and its deals, there’s a sure sign of confidence in the sector. We’ve previously reported on professional football clubs signing eSports players, with AS Roma this month forming a partnership with Fnatic for the FIFA eSports league. Beyond that, there’s also been investment in infrastructure. A brand new arena, specifically for eSports, is to be opened in Las Vegas on March 3rd. Acting as the opening event for the arena will be a $50,000 Halo World Championship qualifier. Later in the month the arena will also host a Madden NFL tournament. With major tournaments being held worldwide, as well as the growth of smaller venues to hold regional and local tournaments, there’s little doubt that there’s a bullish attitude towards eSports. Should companies and individuals take advantage of this and the interest from such as BAMTech, ESPN, AS Roma, Manchester City and Gillette, then the partnerships could be very lucrative.